Akseli Gallen-Kallela. Lake Keitele. 1905. Oil on canvas, 53 x 66 cm. Click the image to zoom in on National Gallery website. This is the painting I am borrowing stillness from right now — studying it, trying to re-make its subtle interplay of beautiful grays, its moving stillness. I expected my first challenge in the realm of freedom to be impatience — that’s why I have committed to a full year of un-planning. Why impatience? Because, at some level, it as an experiment. So many people — especially those who, like me, don’t have many outward constraints (scientists, writers, artists) — wrote about the need to show up and do the work. The underlying idea is that, given any excuse, one wouldn’t work at all. When one works without outer constraints and deadlines, the theory goes, one needs to build a scaffolding for oneself, a structure of plans and routines that would keep one’s workdays from dissolving into nothingness. And I lived by this theory for a long, long time; my whole life, as a matter of fact. But reading and contemplating my journal for 2016 brought a humbling realization: all my carefully designed plans and structures ceased to be (or never were) a scaffolding, but rather an impediment for inspiration, for the organic flow of life wanting to express itself. When beautiful, real things, experiences, insights did happen to me, they happened in spite of this structure, not thanks to it. That’s why I decided to remove the structure completely, open the inner space to the flow of life, and see what emerges then. In this frame of mind, this experiment is going to be a success only if more real and meaningful things happen when I don’t constantly spur myself into work, but just open a clear space for them to show up — without planning, without timing, without scaffolding. But I knew two things in advance. First, even if it does happen eventually, it will be exactly that: “eventually”, not necessarily “immediately”. And the second one: I would be impatiently expecting this “success”, and sorely tempted to stop this nonsense and return to some sort of planning and “goal-setting” if this expectation isn’t met right away. Hence, this commitment to a full year — after all, a horse is likely to stop when its rider stops spurring it like crazy; it will need some time before it feels inspired to play and gallop on its own volition. And the truth is, I don’t really want it to be an “experiment” — that is, something which, by definition, must have well-defined “positive” and “negative” outcomes. The very idea of an experiment is a kind of uneasy compromise between the desire for freedom and the mind’s fear of it. I want it to be an exploration — something to experience with curiosity, to witness with full presence and attention, without any pre-conceived ideas of failure and success. And after all, in the grand scheme of things, it doesn’t really matter that much whether I work more, or less, or not at all. Who cares? The impatience showed up, as expected, but in an unexpected form: as mental noise, as waves of contradictory impulses to do this or that, or both, or another thing entirely. I might have removed all written plans from my life, but they didn’t really disappear from the inside of my head. I desperately needed to still the inner space, but one cannot really force stillness to descend. 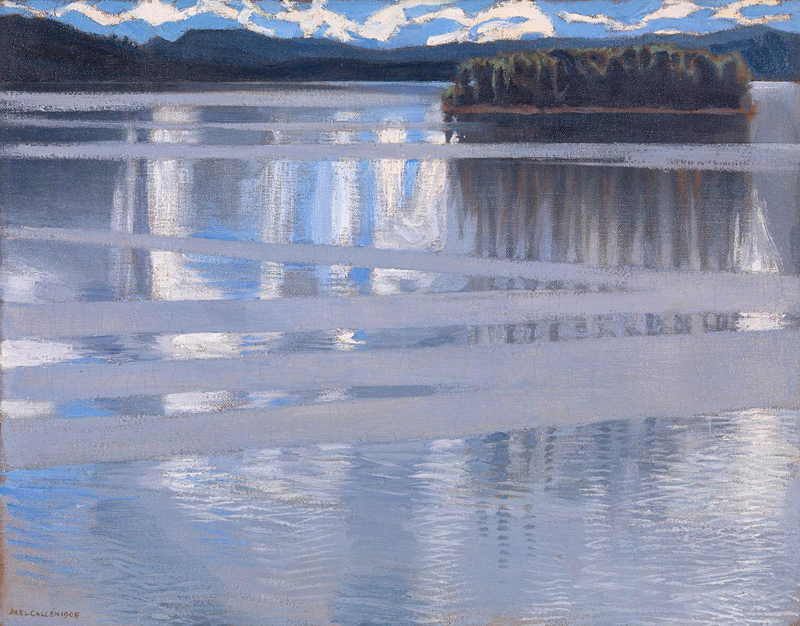 I was helped by life itself, which — unbidden, unexpectedly — brought in this painting for me to contemplate and study, this embodiment of moving, living, free stillness of a northern lake. A place where so many things move, and yet everything is still. It is Eugene’s birthday on February 1, and so I had asked him whether he had a painting in mind for me to re-make it, as a gift. And this was the painting he remembered — it drew him to itself (or even into itself) when he saw it in London in May. Uncharacteristically (for the first time in his life, I think), he even took a photo of its caption, so it would be easy to find it again. He never did look for it, till now— but with this information, was easy to find the high-resolution reproduction kindly provided by National Gallery (you can see it if you click the image above). I don’t really know this artist, and I wasn’t moved by this painting myself back then in London. But right here and now, this was exactly what I needed — and thankfully, there were no “plans and structures” in place to stop me from immersing myself into it, sinking into its gracious stillness.